Simply connect the CONNECT to the audio equipment you already own - your home theater receiver, stereo system, powered speakers, and more - and enjoy the music. The digital and analog outputs, connected to your favorite sound system, deliver superior sound to every room. And when it comes to volume control you've got a choice: via SONOS or directly on your favorite audio equipment. The CONNECT brings great sounding music wirelessly to any room in your house, without a big wiring project. SonosNet 2.0, our latest wireless mesh network technology, provides double the wireless range for whole-house coverage, ensures synchronous music playback, and avoids sources of wireless interference. Which means the music gets to all the right rooms - near or far - at exactly the right time. 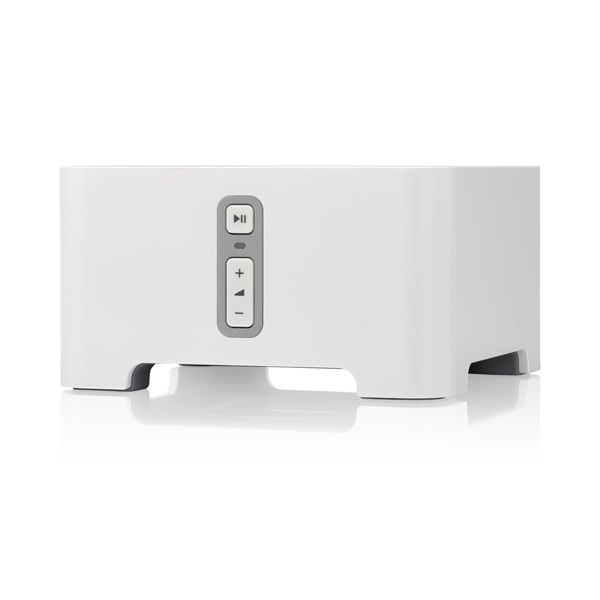 SONOS CONNECT liberates the music on your computer and the Internet so you can play it all, all over the house. Wherever there's a CONNECT (or any other ZONEPLAYER), you can listen to your personal collection of music stored on your computer, plus thousands of free Internet radio stations. And SONOS works seamlessly with the most popular music services so you can stream millions of songs and stations from the Internet to the rooms of your choice. You can even connect the CONNECT to your favorite audio source such as an iPod or CD player and listen on all the ZonePlayers throughout your house. Setting up your CONNECT is incredibly easy. No technical or wiring expertise required. And no need to break through walls or re-wire your entire house. All you need is a high-speed Internet connection and a router to get started. One ZONEPLAYER or ZONEBRIDGE in your system must be connected to the router and all the rest will work wirelessly. Add more ZONEPLAYER in more rooms without adding wires. Unlike most other consumer electronic products, the CONNECT and the entire SONOS system keep getting better even after you buy it. With free automatic software updates you'll always have the newest features and music services to enjoy. Just register your system and SONOS will automatically notify you when software updates are available. Simply press one button and your system updates itself.